The Ski to Sea race has been described as the Bellingham Olympics and is a multi-sport race from Mt Baker Ski Area to Bellingham Bay. The race starts off with a 6.5km cross country ski, followed by a downhill ski (although it is more of a climb since you start and finish in the same spot), road run, road bike, canoe, mountain bike and sea kayak. 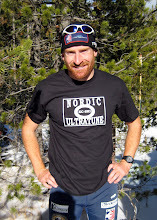 I have been racing in the event since high school and it is fun to add an on snow race to my May training. A huge thank you to John and Beth Barron of Barron Heating for sponsoring the team. We have a great group of guys that look forward to the race each year. I have really enjoyed getting to know the other members of the team. They are some of the top in their fields with Greg Barton leading the way (two time Olympic Gold Medalist-1988). The cross country ski leg makes up the largest ski race in Washington with nearly 500 participants. The race went well and I finished just ahead of Tad Elliot to put team Barron Heating in the lead. Tad and I finished the race and immediately went to watch and cheer the other racers. I kept looking for Caitlin to finish but I never saw her and I began to worry. Turns out she had a GREAT race and finished THIRD Overall! She beat many top male skiers in the country including my teammate Sam Naney, Kent Murdoch, and Marco Bedard. Marco Bedard is one of Canada's top bi athletes and although he didn't have a very good race, I am impressed with Caitlin. Congratulations Babe! The second place team had one of the top sea kayakers in the world on their team so we knew it would be a hard fought race to the finish. Last year we won the race by just seven seconds. The rest of the crew kept the ball rolling and we won the race for the second year in a row. A big benefit of the win is a round trip ticket on Alaska Airlines. With Super Tour Finals in Alaska this year I am really excited to have the ticket. Disassembling the Fawn Hut which we hope to turn in to a place of our own for when we are training in the Methow. The cabin needs some work and it will likely be a project for after Sochi but we had to move it from it's former resting spot by Memorial Day weekend. We are now in Bend Oregon for a week assuming the snow holds up. The skiing has been good but the weather has been too which means the snow is melting fast. Life has been busy and training is hard. I am looking forward to my first week of full time training next week.